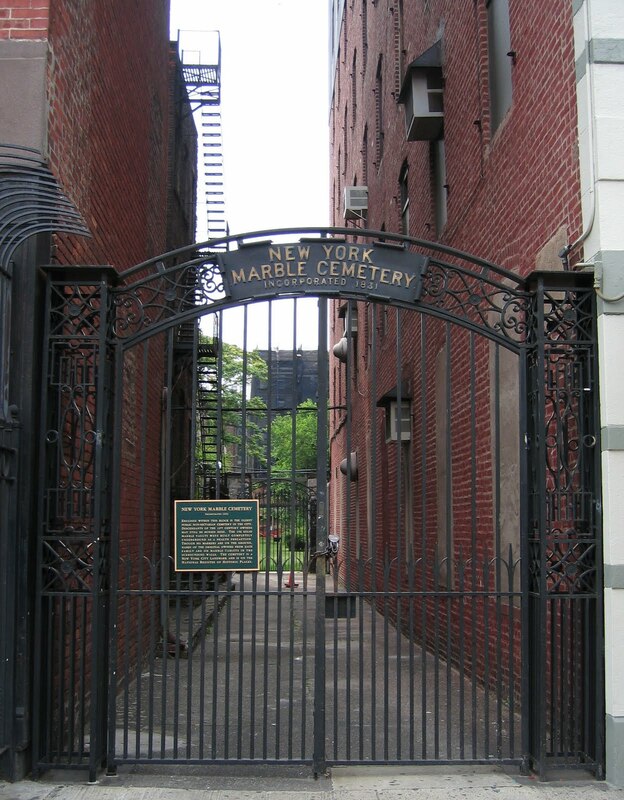 Ananka's Diary: Anyone Up for a Visit to the Marble Cemetery? I just realized that Manhattan's secret Marble Cemetery (you know the one!) is holding its annual open house on October 9th and 10th! Anyone interested in joining me for a visit? Send an email to kikistrike@gmail.com! Too bad I live in Atlanta. well... yes, but there is the issue of parental permission- but if you'd condone running away... i mea, the train station is w/ in walking distance. Awwww...I live in Wisconsin and I highly doubt that my parents would let me go to New York City to visit a cemetery. I wish I lived there!!! i live in california :( talk bout my luck. grr i love cemetarys. weird i knw but whenever i read the descriptions and loving messages of the tombstones i always wish i could meet everyone there. once i saw one with a 4 year old boy and there was a teddy bear inside of a glass case on the tombstone :( i cried. If I can just talk mom into driving me...! Likewise, I'd so love to go. It's a shame I live on the other side of the planet. Australia is a nice place, though. well i'd need about a thosand bucks to get a flight from Montana to N.Y.C then i'd need to stay some where, and I'd need a new kiki strike modeled outfit to wear, soooooooo If you have $2000 sure!! I'll come!!!! However, those of us who can't visit can at least write about our own local unusual cemeteries. We've got some fun ones in San Diego. 1. The old Campo Santo ("Holy Ground") in the Old Town neighborhood had to make way for a widening of San Diego Avenue back in the 1920's or so -- and some coffins weren't moved! And yes, the old cemetery may be closed to new internments, but it's got a facebook page. 2. Pioneer Park in Mission Hills is a short but nasty (uphill) bike ride away from the Campo Santo. It's even sadder -- the City converted the old Calvary Cemetery into a park back in the 1970s. Only the grave markers were moved, and by moved I mean "dumped in a ravine in Mt. Hope Cemetery." Cue the 1990s, and I could see those broken, shattered headstones whenever I rode our light rail one of the local libraries. Eventually, a sample of the headstones in the best condition were put up over in the "southeast corner." I seem to have the same problem as most people here. Living across the country is quite a disadvantage. If you go tell us about it please!! It looks awesome! theres a bunch in my yard (we use them as walkways) and one, for Cornelius H. Hill has a lovely little poem on it: Friends and physicians could not save/ my mortal body from the grave/ nor shall it confine me here/ when Christ our savior doth appear. What does the plaque say on the front of the gate?